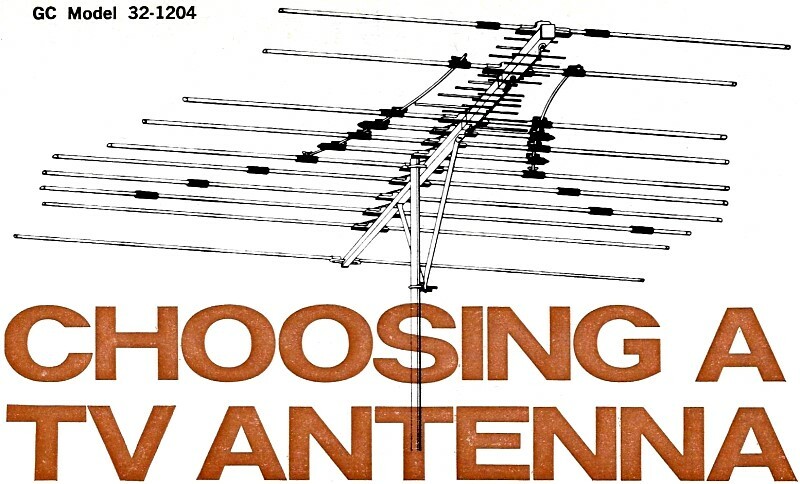 There was no shortage in the 1970s of articles recommending how to choose and install the perfect television antenna. People would swear by the advice given. This piece by Mr. Harvey Swearer is a good example. 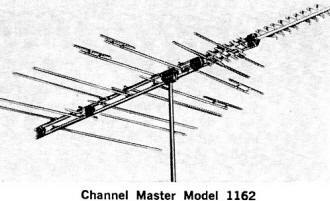 Of the four manufacturers with pictured antennas - Gavin, Channel Master, Lance, and Jerrold - only Channel Master still exists today. Lance Industries made the ColorMaster TV antennas, and has appears to have been out of business since around 2003. Gavin Electronics seems to be gone as well. 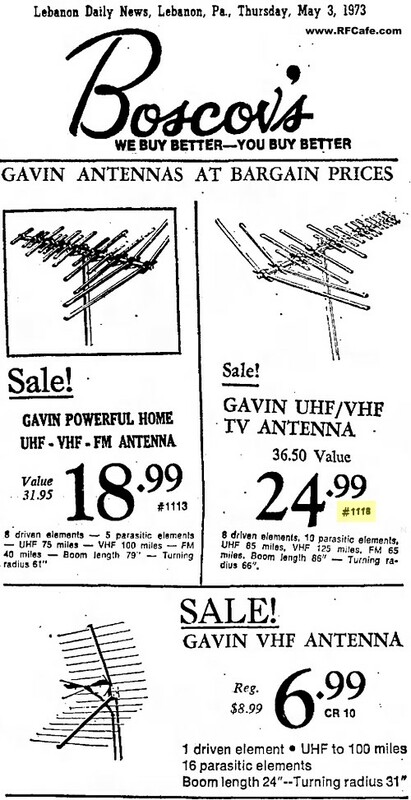 I found an ad for the Gavin #1118 antenna (like the one in this article) in a 1973 Pennsylvania newspaper for $24.99. 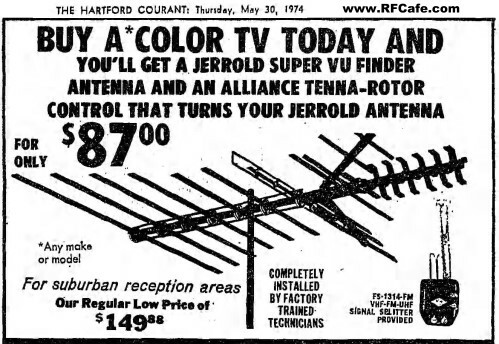 Interestingly (to me, anyway), the ad was run by Boscov's department store, which is the company that just moved into the former Sears, Roebuck store here in the mall in Erie, PA (they don't sell antennas anymore). Jerrold Electronics is also long gone. The above ad came from a 1974 edition of a Connecticut newspaper. 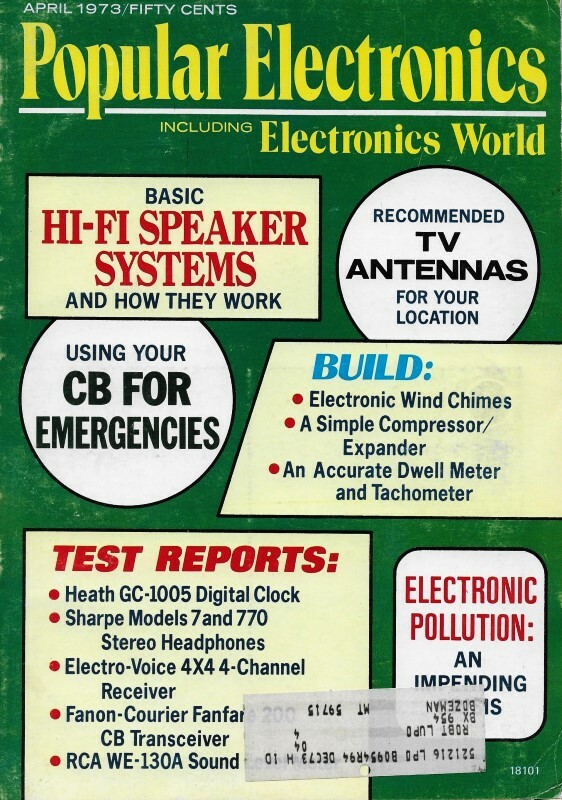 See the TV antenna selection articles in the December 1958, March 1972, and April 1973 issues of Popular Electronics. Television antennas are a matter of prime concern to some 85 percent of the U.S. viewers not on cable or community antenna distribution systems. It is an established fact that the selection of an antenna, especially for color viewing, can mean the difference between good picture and sound quality and a total loss of the investment for the TV receiver. 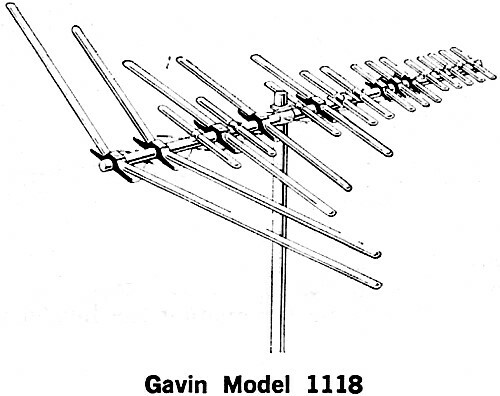 Many of the problems viewers attribute to their TV receivers can be cleared up with the aid of proper selection of an antenna for the local signal conditions and proper antenna connection. The TV antenna manufacturers recognize that their products must undergo periodic improvement to maximize performance and satisfy consumer demands. Their antennas are continuously redesigned to better cope with all types of electrical noise, the growing numbers of viewers in outer suburban and rural areas where signals are much lower in strength than they are in the urban areas, and "all-color" broadcasting. When you begin to shop around for a new TV antenna, you are likely to find that the task is not an easy one. Complicating matters is the fact that admen often play the "numbers game" with specifications, and even true specifications can vary tremendously in the same antenna category from one manufacturer's product to another's. 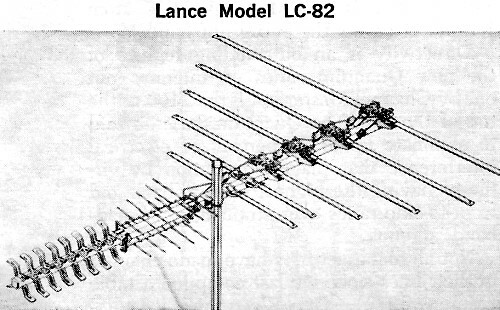 Also, many antennas are known by catchy names that often refer to an entire line instead of a specific antenna model. (Fortunately, the antennas also have model numbers that you can ferret out if you are persistent.) Nor are prices necessarily a good guideline to determining the quality of an antenna. 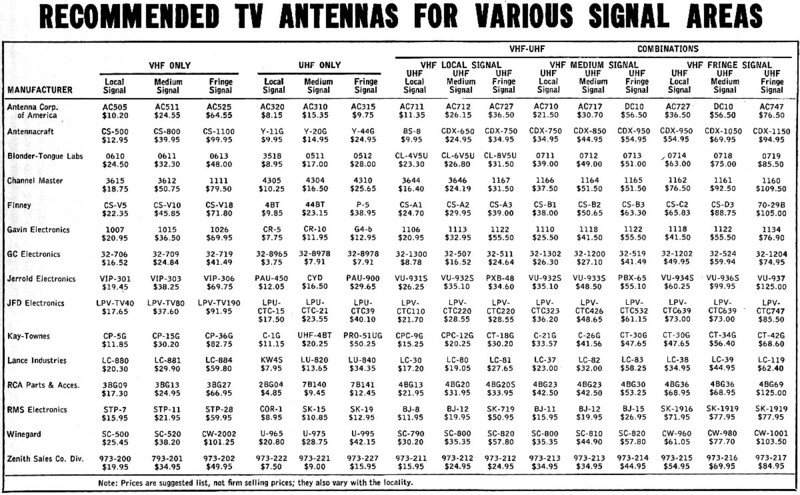 For example, it does not necessarily follow that an antenna selling for $100 is any better a performer than is an antenna in the same category selling for $75 by a different manufacturer. However, you can make use of the published specifications if you know what they mean. This means that you must first know what your local signal conditions demand in the way of gain, directivity, mechanical stability, etc. You must also know whether your viewing area is classed as local, medium-distance, or fringe. Then you have to take into account how much noise immunity your antenna must have to provide a clean signal at the antenna terminals. The Current Situation. The current crop of TV /FM antennas have more gain than did their predecessors. They are also less prone to respond to adjacent-channel interference and electrical noise, have better weatherproofing, and a number of other features unavailable to the same degree in previous models. To provide you with a rough guide in selecting a TV antenna, we have compiled a table of recommendations made by the various manufacturers. The table, you will note, lists only one model of each antenna in a given category and subgroup. Most companies have more than one antenna model per group; so, it is to your advantage to investigate the other antennas before you buy. Let us look at what the various manufacturers are offering. Antenna Corporation of America's deep, deep fringe Model AC-747 provides 100 percent uhf/vhf isolation. The Model SK1919 from RMS features distant station reception to 175 miles on vhf and almost 100 miles on uhf. The design pattern parallels that used in the space program, with corner-reflector/ driven-disc directors for total uhf performance. For vhf and FM, multiple tuned elements cut to channel resonance provide optimum coverage. RCA's Permacolor line features top quality performance. Zenith's Chromatenna delivers peak picture performance with 20 different models for color and monochrome on the vhf, FM, and uhf channels. Antennacraft offers their new Colorfinder series along with the regular CDX line in a wide selection of models to meet various conditions, topped by the CDX-1150, as shown in the table. Log-periodic antennas feature low SWR, broadband response, easy impedance matching, and high directivity. Element lengths are far more critical for high front-to-back ratios. Too, close spacing between directors and driven elements is essential. These features are exemplified in JFD's Model CTC-747 antenna. Blonder-Tongue's Model 0719 antenna accents interference-reducing directivity, high gain, and flat response with a non-radiating transmission line section that feeds the active dipole elements in a multi-frequency range. 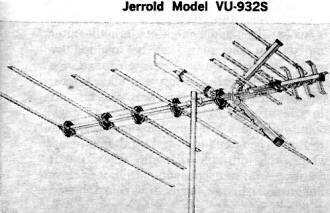 The Weingard Color-Wedge emphasizes pull that is exceptional in the vhf/FM/uhf Model CW-980. A corner reflector that offers flat response with a large capture area is the Model VU-937 from Jerrold. It covers the entire uhf band. Not all manufacturers have made changes in their lines since we last compiled a table (March 1972). GC Electronics (Audio-tex brand name) is sticking with a line they feel meets the demand for good reception. The same applies to the entries provided by JFD Electronics, Lance Industries, and RMS Electronics, all of which are exactly the same as they were a year ago. RCA Parts and Accessories' listing has changed by only one entry, from the old Model 4BG30 to the newer Model 4BG20S under the uhf-only fringe signal category. All of the information given in the table was solicited from the manufacturers represented. Since space was limited, each manufacturer was limited to only one entry per category. The recommended antenna models are the choices of the manufacturers themselves. 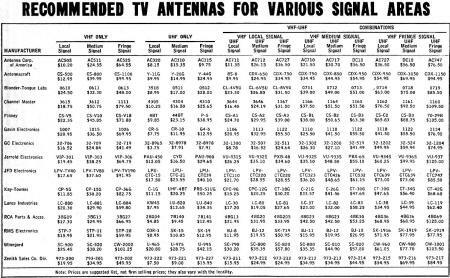 (We did not test any for this roundup of updated antenna listings.) Obviously, there are some antenna manufacturers who do not appear in our table. Also, those manufacturers who are mentioned in all likelihood have other antenna models in their lines from which you can choose. Making the Connection. 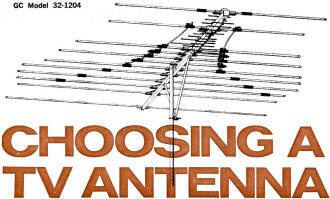 Now that you have chosen an antenna, it is necessary to consider how you hook it up to your set. Overlooking transmission line characteristics is a common mistake and many users do not have enough signal at their receiver terminals to afford throwing away 50% or more. If the antenna does the good job that it was designed to do, a proper lead-in must be used to deliver most of that signal to your receiver - under all conditions. Losing half or more on the way is not a good deal; and, furthermore, it is unnecessary. Old, dirty, brittle, cracked, or improper types of lead wire must be replaced. The 8290 or 9090 (Belden) for shielded 300-ohm line and 8285 or 9085 for unshielded applications offer stable, all-weather replacements (or initial installations). If you don't have ignition, transmitter, or electrical interference in your locality, the shielded line is not your best bet, unless you have signal to spare. There will be some loss at higher frequencies with shielding, but isolation of all external factors, including the weather, may compensate for part of the loss. As noise pollution is increasing daily, it should be considered carefully when making a perfect installation; and if any doubt exists about the choice between shielded and unshielded, make it the former. In considering the effects of dirt and weather on the transmission line, note that typical flat twin-lead may show a signal loss exceeding 95% under adverse conditions. Shielded (8290 or 9090) shows no loss under similar conditions. Ghost effects become more pronounced as the standing wave ratio increases and only by maintaining a figure as close to 1:1 as possible can optimum results be expected. How can this SWR figure be obtained? Only by terminating the line in its characteristic impedance so that no standing waves exist and the line represents a pure resistance with negligible attenuation. If the 300-ohm antenna terminals are connected to a 300-ohm transmission line without bends, punctures, mashing, or external disturbances and the line is connected to the 300-ohm terminals at the receiver, then and only then will standing waves be eliminated, insuring a good, satisfying picture. Directivity is an outstanding feature of the new Quantum series of antennas put out by Channel Master, with the 1160 at the top of the line. The Quantum Series is said to eliminate up to 90 percent of electrical interference that plagues reception by virtue of having the highest front-to-back and front-to-side ratios ever attained in a broadband antenna. Transmitting path reflections result in severe ghosting problems that are only partially corrected with quality, shielded transmission lines. Careful orientation of the antenna array will often be instrumental in reducing ghosts, but in some cases, it may be necessary to have an antenna with exceptionally good front-to-back features or even more directivity. The latter will do much to reduce side-lobe pickup and possible paths for reflected images. Changes in the electrical field around or between the lead-in conductors will alter impedances and may best be avoided by using shielded line. Antenna impedance may be affected by corrosive smoke, fumes, salt, or other airborne materials which build up a resistive coating over a period of time. Bent, missing, or loose elements also alter the output impedance of the antenna; and when using unshielded lead in, avoid metal spouting, flashing, etc. by at least a few inches and do not have any sharp bends or pinching.